Sunshine this morning followed by increasing clouds and a few showers this afternoon. Thunder possible. High 73F. Winds N at 10 to 20 mph. Chance of rain 30%..
MINOT — The postseason got off to a rough start for the Bismarck Bobcats. David Raisanen scored two goals, Nicholas Grabko was nearly flawless in the net and the second-seeded Minot Minotauros took Game 1 of the NAHL Central Division playoff series 5-1 over No. 3 seed Bismarck on Friday night at Maysa Arena. Grabko stopped 35 of the 36 shots he faced and kept the Bobcats from getting their offense in gear in the opening game of the best-of-5 series. “I thought their goaltender made some timely saves,” Bobcats coach and general manager Layne Sedevie said. “We didn’t play bad. … We’ve got to try to find a way when we have shots to bury them. After the Bobcats’ first line had a flurry of good scoring opportunities in the opening minute, Minot’s Brennan Couet scored 1:42 into the contest on a floater through traffic off an assist from Lincoln Erne. Couet, a defenseman, notched two goals and four assists during the regular season. Nebraska-Omaha commit Blaine Warnert, who joined the Bobcats after his high school season at Chaska, Minn., scored his first goal for the Bobcats at 6:01 to even the game at one goal apiece. Warnert, an 18-year-old forward, racked up 40 points – including 25 goals – in 25 games for Chaska. 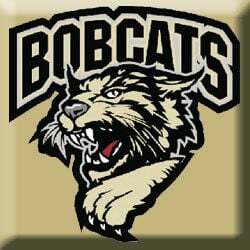 The Minotauros capitalized on a Bobcat turnover late in the first period to regain the lead. Andrew Kangas snatched up a rolling puck and fired it past Bobcats goaltender John Roberts into the net at 14:17 for a 2-1 Tauros advantage. Kangas had 19 goals and 41 points in 53 regular-season contests. Minot outshot Bismarck 13-6 over the opening 20 minutes, taking a one-goal lead into the second period. A promising start to the second period unraveled in a hurry for Bismarck. The Bobcats came out pressuring the Minotauros at the start of the period, firing 11 shots on net over the first six minutes, but Grabko kept stymieing the Bobcats. And on their first shot of the period, Minot added to the lead. At 12:54, Raisanen gave the hosts a two-goal advantage. Raisanen posted 24 goals and 50 points in 60 games during the regular season for Minot. Twice, Grabko made a big save to deny the Bobcats. And each time, Minot quickly followed with a goal. Matthew Gellerman – who had seven goals and 19 points during the regular season – lit the lamp for Minot at 11:47, making it a 4-1 lead for the Tauros. At that point, the Bobcats were outshooting the Minotauros 17-5 in the period, but had surrendered the only two goals of the period. Trailing by three goals, the Bobcats pulled Roberts in favor of backup Atticus Kelly. The Bobcats outshot the Minotauros 18-13 in the second, yet went to the final period trailing 4-1 with Grabko turning away all 18 shots he faced in the period. Kelly stopped all eight shots he faced for Bismarck in the second period. The Bobcats opened the third period on a power-play for 1:59, but couldn’t cash in as Bartek Bison’s blast caromed off the crossbar. Bismarck went 0-for-4 on the power play, while Minot was 0-for-2 with the man advantage. Minot ended up with 37 shots on goal to Bismarck’s 36. Grabko kept the Bobcats’ offense bottled up, posting 12 saves in the third. Raisanen’s second goal of the night for Minot was an empty-netter at 19:08 that made the final 5-1. Kelly stopped all 18 shots he faced in relief of Roberts. Game 2 is set for tonight at 7:35 p.m. at Maysa Arena. The series shifts to the VFW Sports Center for Game 3 on Friday, April 19 at 7:15 p.m. Game 4, if necessary, is set for April 20 in Bismarck, with a potential Game 5 slated for Monday, April 22 in Minot. First period: 1. Min, Brennan Couet (Lincoln Erne), 1:42. 2. Bis, Blaine Warnert (unassisted), 6:01. 3. Min, Andrew Kangas (unassisted), 14:17. Penalties: Bis, Ethan Gauer (high sticking), 15:33. Second period: 4. Min, David Raisanen (Wilmer Skoog, Didrik Henbrandt), 6:52. 5. Min, Matthew Gellerman (Cole O’Connell), 11:47. Penalties: Min, Connor McGinnis (checking from behind), 4:11. Min, Joseph Harguindeguy (hooking), 14:00. Bis, Jacob Marti (slashing), 18:53. Min, Fritz Belisle (slashing), 18:53. Min, Henbrandt (tripping), 19:59. Third period: 6. Min, Raisanen (Nikolai Charchenko), 19:08, (en). Penalties: Min, Erne (holding), 10:28. Min, Kyler Kleven (cross checking), 14:59. Min, O’Connell (roughing), 14:59. Bis, Nicolas Appendino (cross checking), 14:59. Bis, Appendino (roughing), 14:59. Bis, Willy Stauber (slashing), 16:41. Goaltender saves: Bis – John Roberts 11-3-x – 14; Atticus Kelly x-8-10 – 18; Min – Nicholas Grabko 5-18-12 – 35. Records: Bismarck 34-22-5, Minot 37-21-3.